Is an Innocent Man Going to Die Tomorrow? 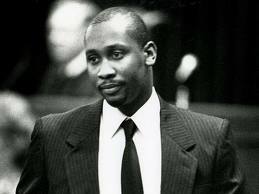 You may have been following the story of Troy Davis, or at least the story that has developed over his pending execution. Davis was refused clemency this morning and is schedule to die of lethal injection tomorrow in Georgia. He is accused of shooting off-duty police officer, Mark MacPhail in 1989. His defense has strongly maintained that this is a case of mistaken identity and seven of the nine witnesses from the 1991 trial have recanted their statements and one man, who did not testify, claims another man admitted to the shooting. In fact, no physical evidence linked Davis to the crime. The case is based on hearsay and circumstantial evidence. Davis has the support of high-profile figures such as former President Jimmy Carter, ex-FBI Director William Sessions, and former U.S. Rep. Bob Barr. Even three jurors from his trial are now in support of clemency. In 2010, Davis was given a hearing to convince the U.S. Supreme Court of his innocence—an opportunity that the high court has not dealt out to any condemned prisoner in 50 years. He was unable to sway the justices who found, “minimal doubt on his conviction.” The judge, however, admitted that the state’s case was not ironclad. So what do you think? Is the death penalty serving the purpose it was intended to? What happens where a case is shrouded in doubt? The death penalty has ridded the world of some pretty heinous individuals, but it’s impossible to deny that it has also taken innocent people from the world, too. You can read more about Davis’ case HERE. Be sure to click on “Watch Videos” under “Ger Involved” and learn about Davis’ case and why there is too much doubt. It will leave you completely baffled as to why the parole board has denied him clemency. Categories: Death Penalty, Prison Today | Tags: death penalty, execution, innocent, reasonable doubt, The Innocence Project, Troy Davis | Permalink.